Reno, NV (8/26/2013) - Prepping for the 2013 Best in the Desert Vegas to Reno race started out great. The week before the race everything was sorted out and ready to go, the team thought they would have an easy week leading to the race. A week prior Trent Kendall took 3rd place in a difficult 2.5 hour desert race in Flagstaff, AZ and Joe Ramos placed 6th after a bad soil sample in the woods at the Cinder Mountain 100. Joe was banged up a bit but would be ready to race the Vegas to Reno. Joe got things set up for our sister ATV expert team from New Jersey to come out and prep at our shop. Their Bike is fresh and ready so they wanted to go testing on Wednesday, so Joe decided to go with them and do a last shake down on the Q11 race machine. Seventeen miles into testing, the Q11 Race bike seizes up and has to be towed to the truck, Joe has a panic attack as this is 2 days before the green flag drops. So Joe gets on the phone with our engine builder KMS Performance and Kelly at KMS assures us that it will be done even though KMS did not build this engine. They guaranteed they would do everything in their power to get it fixed for us that night, now that is customer service! Kelly at KMS was at the shop until midnight replacing the entire top end of the engine with some help from Trent, pit chief Adam and the boys from jersey. Kelly dyno tuned and broke in the engine on the dyno that night. The team is scheduled to leave at 9am the next day and Joe goes out to our testing track that morning at 6am to put some desert test miles on the machine. Everything checks out so the team hits the road for Vegas. We get up at 4am and head to the start a short drive away, unload and go over everything once again. Staging is at 5:15 and the chase trucks head off. It's quiet and Joe collects his thoughts. As the Pro bikes leave the line Joe thinks to himself that we have 550 miles, we need to ride smart and safe. Just then Joe noticed a rider pushing his bike back to the starting gate. His day might be over 50 yards from the start, so again Joe do one last look over the quad to make sure he doesn't see any drips or anything loose or out of place. 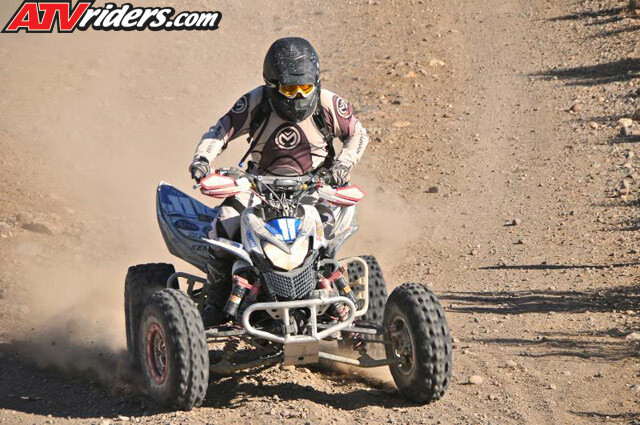 Joe starts the race in 3rd place off the line in the ATV Open Pro class of 5 with each Pro starting 1 min apart. Joe gets the green light and is on the gas out of the Red Bull starting arches like a cannon. Blazing down the dirt trails at top speed, picking off a few Expert Dirt bikes that start in front of the Pro ATV's and using a Trophy truck siren to warn them that the Q11 quad is approaching. With the super loud Trophy Truck siren the bike guys quickly hold their line and allow Q11 to pass easily. As Joe passes through Pit #1 the crew Informs him that he is 2 min behind the Lead Quad ,which is exactly where we started, so Joe keeps pace and rides smart, watching the engine temp on the Trail Tech Voyager GPS computer to make sure all is running well on our freshly KMS Performance Built Honda TRX 700. "Thanks for stopping for me! It wasn't a compound fracture in the wrist but it was broken and dislocated so I was pretty ugly. The bike was pretty mangled, exhaust was pointing straight up, rear fender ripped off, sear was ripped in half, and the Scotts stabilizer was ripped completely off. As for my injuries, broken wrist (requires surgery), frontal lobe brain bleed, enlarged colon, fractured left pinky, broken collar bone, 2 broken ribs, fractured pelvis, and a fractured left knee. The crash happened at RM 51 and I can barely remember anything after pit 1. If it weren't for that bell helmet I was wearing, I don't think I would be talking to you right now. The doctors say it's a miracle my brain didn't bleed more"
Trent takes the quad from Pit #2 to Pit # 3 without any issues other than dust from the slow expert bike riders who start ahead of the pro ATV's. Trent arrives at pit 3 still in 4th place but making time on 3rd. At pit #4 we do a heavy maintenance pit stop and change an air filter lid, full fuel stop and check the fluids. All is good and Joe jumps on about 1 minute behind 3rd place. Joe has 60 miles before the next pit and ran this section last year so Joe takes full advantage of the familiar trail and was able to catch and pass the 3rd place Pro Quad putting Q11 physically in 3rd place coming into pit #5. Joe and chase truck #1 head to Pit #7 and Trent's chase truck (chase #2) head to pit #6 for a visual. At pit 5 Trent Hops on and hits the trail full bore with sights locked on 2nd place, Trent takes it to pit #6 on the gas and roaring, the KMS Performance Yuma Mortuary bike is now completely broken in and singing like a bird. Trent passes a few more bike teams, as you can tell we are still wondering why they start expert bikes ahead of pro quads. Chase 2 calls in as Trent clears Pit #6 in 2nd place. Pit #6 Joe is ready and waiting as the number Q1 pro quad leader comes in and we wait for Q11. About 13 min later Trent comes in on a flat rear tire. This would seem like a huge issue and definitely slowed Trent down, but Kenda tires kindly stepped up to the plate offering the Q11 Team tire support this year and at this point this is our 1st flat of the day so far. Last year at this point without Kenda tires we were already on our 5thflat tire so this was a definite improvement. We change the tire, check the oil level , change an air filter, top of fuel and Joe hits the trail for a quick 30 miles of fun to pit #7. Pit #7 Joe comes in with the belly skidplate dragging but he made up a few minutes on the leader. The crew quickly fixes the belly skidplate. From here Trent rides through pit 8 straight to Pit 9 for a 58 mile leg. Joe rides from pit 9 to 10 with no issues and Trent is ready to go. The Q11 crew turns out a lightning fast pit stop , checking Oil level, coolant level , changing an Air filter lid and a quick once over on the quad because this is where the Chase trucks have to split up to cover the pits faster than the Race Quad. So chase truck #1 heads to pit #13 with Joe. Chase truck #2 heads to Pit #11 for just a splash of Fuel before Trent Heads to the "Dark side of the Moon" and will not have any contact with the Crew for 60 miles so we make sure that everything is tight and in order for the big run without chase support. Chase #2 calls chase #1 to let them know that Trent is through pit #11, running great and cut our time down a few more minutes, chase truck #2 heads to the finish line from here. We have a local spectator and desert racing supporter that offers support at remote pit #12 but we did not need him this year but always appreciate his service, thanks Lance! At pit #13 the crew at this pit have no idea if Trent is still running or not, the last known contact from Trent was at Pit #11, but as the leader pulls out of the pits Trent rolls in about 13 minutes behind him and on a completely demolished rear Tire and because of the low ground clearance with the rear flat the quad was banging off the rocks and lost the belly skid plate for good this time. Trent had been riding on the rear flat tire for 30 miles. The pit crew quickly change 2 tires, another fluid level check and swap out the air filter lid for the last 75 mile of the race because this is the last time the pit crew will see the race bike until the finish line. Joe jumps on and speeds off to pit #14 where we have a remote pit crew that offered help here as they were already pitting for the N11 bike team. It did not go well for Joe from pit 13 to pit 14; the transmission on the quad was acting kind of funny in 2nd and 3rd gears. It would not stay in 2nd or 3rd gear, so Joe was easy on the transmission to pit #14. Once at pit #14 the remote pit crew of œBaja Seve" looked over the bike and topped her off on fuel, and sent Joe on his way for the last 48 miles to the finish line. Now with this transmission issue and no belly skid plate protecting the engine on the bottom, Joe went into œget her to the finish mode and was easy on the transmission and clutch with only 3 usable gears and a gnarly hill climb in to the finish. Joe wanted to be sure he doesn't damage the exposed engine in the major rock garden on the last 10 miles so it was a 1st gear slow hill climb to the top . Once Joe is on top of the hill climb and on the flat roads he is back on the gas with the 2 high gears and to the checkered flag. As the Q11 Open Pro quad comes through we already know that we are a few minutes behind the leader but even with the belly pan issues and 3 gears Joe was able keep the 3rd place quad at bay to the end and not losing any more time to the leader for an official time of 11 hours 5 minutes and 33 seconds. 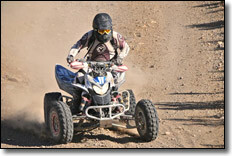 Fast enough to be the 13th machine overall to the finish line, and 2nd ATV to the checkered flag. Not a bad finish for having KMS Performance rebuild and dyno test the motor 2 days before the race. Last year we had 9 flat tires and this year we were lucky enough to have Kenda tires on the machine and we went almost 200 miles before the 1st flat tire. As we load up the race quad we get the dreaded phone call from our sister expert ATV team from New Jersey stating that they are "Done" and have to put their quad on the trailer. Congrats to the Q1 team for another strong race and major props to Cody Mitchell on the 3rd place quad. He almost iron-manned the entire race after his team mate was injured during the race. In Closing , the riders Joe Ramos and Trent Kendall have the easy part; just ride, but the crew puts in long hours wrenching , testing and chasing for the Q11 Yuma Mortuary, KMS Performance, Moose Racing , Barkers Exhaust TRX 700 , but it's the support groups Q11 Team has to thank for this awesome finish! *Special thanks to:* The Pit Crew: Jamie Ramos, Darren Mattice, Chris Wilson, Lavar Kendall, Adam Barnes and our families. Sponsors: Yuma Mortuary, Barkers exhaust, KMS Performance, Kenda Tires, Spider Grips, Moose Racing, United Distributing, DFR Graphics, LoneStar Racing, Wolfsnout, Drytec off road racing, Rich Glasgow fabrication.